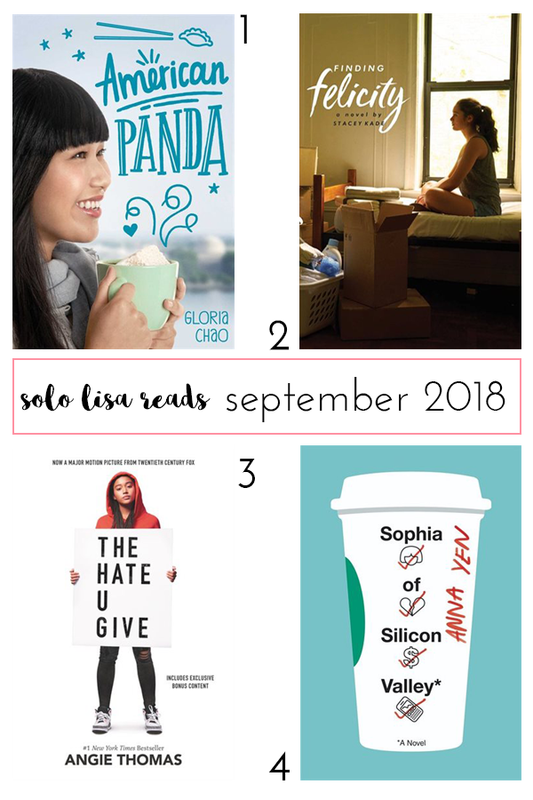 A new season, 4 new recommended reads! Time to curl up under a blanket with warm socks and a steaming cup of tea. 1. American Panda by Gloria Chao. 17-year-old Mei has her whole life laid out for her by her rigid Taiwanese-American parents: work hard, get into MIT, become a doctor, marry a nice Taiwanese boy, and have tons of Taiwanese babies. Never mind that she's deathly afraid of germs and literally can't stomach her biology classes, has zero interest in becoming a doctor, and is secretly developing feelings for a cute Japanese classmate. The price of not following the plan? Disownment, which is exactly what happened to her now-estranged older brother. As the lies to her parents accumulate and the pressure from all sides ratchets up, Mei must find the courage to stand up for what she really wants. Highly recommended if Crazy Rich Asians and To All The Boys I've Loved Before have you craving more lighthearted romantic/comedic novels starring Asian-American characters. 2. Finding Felicity by Stacey Kade. Caroline Sands is a loner who'd rather binge-watch 90s TV shows on her laptop at home, so making friends is hard enough, but it feels impossible after her parents divorce and she moves to Arizona with her mom. To relieve her anxious mother's guilt about the move and reassure her that she is indeed making new friends at school, Caroline invents an elaborate fantasy social life based on characters and storylines from her favourite show, Felicity. The facade comes crashing down at a disastrous graduation party attended by nobody. Caroline's mom, more anxious than ever, puts Caroline in therapy and almost forbids her from attending an out-of-state college. It's up to Caroline to prove to her mom and herself that she can make friends and adjust to a new environment, but can she do it without retreating to the comfortable fictional world of Felicity? This YA book will appeal to fans of 90s teen TV shows and introverts alike. The details of how introverted Caroline navigates the social world of college ring true in a sometimes cringe-y, sometimes endearing way. 3. The Hate U Give by Angie Thomas. 16-year-old Starr Carter comes from an underprivileged inner-city neighbourhood but goes to a tony prep school mostly attended by white students. Starr keeps both spheres of her life in careful balance, constantly code-switching, anxious not to appear "too good" for her old neighbourhood or "too black" to her classmates. This precarious balance is shattered when Starr's childhood friend Khalil is pulled over and shot by a white police officer, with only Starr as a witness to the whole thing. The incident leads to national headlines and riots in her neighbourhood, and irrevocably changes Starr and her family and friends. I was blown away by the authenticity and specificity of Angie Thomas's narrative voice and the poignant, heartbreaking, enraging detail with which she depicts Starr's world; she made the experience of being black in America visceral and understandable for readers who have no firsthand knowledge of such. I'm looking forward to seeing the movie adaptation this fall, but I'm pretty sure I'll ugly-cry during it more than once. 4. Sophia of Silicon Valley by Anna Yen. Okay, moving along from YA to something a little more adult! Sophia of Silicon Valley piqued my interest due to its protagonist (Asian-American Sophia Young), subject matter (one woman coming into her own career-wise in the fast-paced world of Silicon Valley investor relations), and book cover (so cute!). The real-life inspirations for some of Sophia's bosses are easily recognizable, and a cursory glance over Anna Yen's LinkedIn profile, which includes previous stints at Pixar and Tesla under Steve Jobs and Elon Musk, confirms suspicions. This is a juicy, dishy book by someone who is the ultimate Silicon Valley insider, and Yen's descriptions of the nitty-gritty of tech companies will ring true for anyone who's ever worked in the industry.